Polypropylene Plastic Zip Ties | Polypropylene Cable Ties | Cal Fasteners, Inc. Polypropylene cable ties offer greater moisture and acid resistance than nylon cable ties, making them ideal for a range of applications where water and chemical exposure is common. Cal Fasteners carries 35-pound capacity polypropylene zip ties in natural and black. Single-piece construction and advanced pawl and teeth designs offer increased tensile strength. Tapered tails with finger grips allow for stress-free handling and alignment, and low insertion and pull through force makes tightening these cable ties easy. 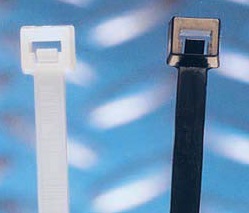 Request a quote on polypropylene zip ties, or contact Cal Fasteners to learn more.